Timber Creek is swollen with runoff from the melting snow and the rain storms hitting the area. When some surveyors don't check in, Paul Fitzgerald leads the rescue team to find them. He must confront his past to be able to move forward. When things start to spiral out of control, will everything slip through his fingers? Melissa Hampton has her own issues she is trying to deal with but when people in town start acting strangely, she must decipher who has her best interests at heart and who just wants their own way. 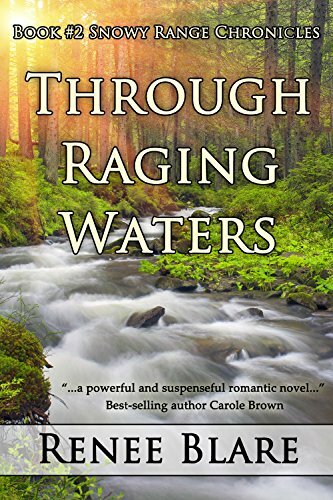 "Through Raging Waters" is the second book in the "Snowy Range Chronicles" series. I think that it would be very beneficial to read the first book, "To Soar On Eagle's Wings", first as the characters and relationships from the second book are introduced in the first book. I found this book to be a white water ride of action and suspense. I didn't find there to be a lot of romance. Paul and Melissa seemed to just suddenly like each other (although they did seem to be "checking each other out" in the first book). Melissa digs up some questions about her mother's past and I didn't feel that all of them were answered by the end of the book and near the end I was confused when Paul called her by a different last name as I didn't see anything that explained that. The characters grew in their relationships with each other and with God, which was nice. I stayed up late reading too many times because the book just pulled you along and you didn't want to put it down and have to wait to see what was going to happen. There were many twists and turns in the plot that kept me guessing as to what was going to happen right up to the end. I found this book to flow differently that the first book in the series, but I enjoyed reading both of them. Renee Blare’s nose has been buried in a book for as long as she can remember. Raised in Louisiana and Wyoming, she started writing poetry in junior high school and that, as they say, was that. After having her son, a desire to attend pharmacy school sent her small family to the University of Wyoming in Laramie. She’s been counting pills ever since. While writing’s her first love, well, after the Lord and her husband, she also likes to fish and hunt as well as pick away on her classical guitar. 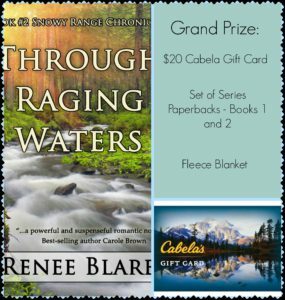 Nestled in the foothills of the Wind River Mountains, she lives in Wyoming with her husband, crazy dogs, and ornery cat. 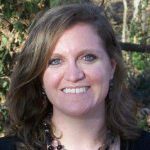 She serves her beautiful small town as a pharmacist while penning her stories about struggling Christians as they travel along the journeys of their lives. She loves to interact with readers and invites you check out her website, blog, and social media. Five years ago, I wrote a book…and then I wrote another and another and another. Many said that the words flowed like a river onto the page. Or I painted a picture with letters. As for me? I simply write what I see so you can see it too. What about you? Do you want to write a book? If so, there’s one thing I’d like you to know. A book’s like a child. It starts out small or simple with garbled language…often repetitive and indistinguishable. Kind of like when a baby babbles “dada” over and over. And then that moment comes when you rejoice because you hear him say “mama.” That’s the growth every book…writer…reader…yearns for. Different stories float around inside an author’s mind, flowing in a way much like labor. Some authors plot, others don’t. And still others combine the process in a convoluted method. But like birth, no matter how the words eventually find their way to the page, the development of a book doesn’t stop with its first dawn. It takes time, energy, and growth. Take my first release, To Soar on Eagle’s Wings. Five years ago, I wrote it, my very first book, in three months. And it was awesome! I couldn’t believe it. God brought the plot together in a phenomenal way. But publication wasn’t the next step. I had a lot to learn before that could happen. My latest release, Through Raging Waters is the example of a writer’s growth, but also her soul. I learned that I had to leave more than my knowledge and my heart on the page. I needed to leave a piece of my soul. When you read Paul’s struggles, you read mine. Melissa’s fear and confusion? Yes, they’re mine. The anger, the pain . . . the trials, the lessons learned are scriptural but also first-hand, taught by my Father. Writing is more than a job. It’s more than a hobby. It’s sharing your knowledge, your hope with the world. So if you want to write a book. Do it. Then take that next step, and the next. You’ll get there. Oh, and I can’t wait to read it! I received a free copy of this book for me to give an honest review and participate in the Celebrate Lit tour. All thoughts and opinions are my own and no other compensation was received. 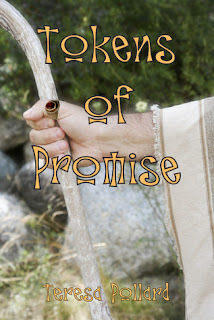 Inspired by The Bible, Genesis 38, "Tokens of Promise" is an imagination of the love story of Judah and Tamar. “Beware, Prince of Hebron, her witching ways are strong.” Ben Qara’s evil words still rang in his ears. Judah is sure he was bewitched by the beautiful Tamar. She is all he can think about. But no, it must not be. He will not break his vow to Yah. He already has a wife, and he will have only one. Tamar must marry Er. Rescued from disgrace by the handsome Judah, Tamar is already in love with the kind stranger. She eagerly followed Emi’s advice on how to win him. It almost worked. He’d promised. If only his servant hadn’t come at that moment, she’d be his wife now instead of going home with him to be his daughter-in-law. Why had her father agreed to this? Surely he could see her destiny was with Judah? When I agreed to review "Tokens of Promise" I only knew that it was a fictionalization of the story of Judah and Tamar from Genesis 38. I did not know about the notation that said "We recommend that this fictional story be reserved for readers aged 18+, due to the non-graphic inclusion of sexual themes." I'm not sure that I would have read it then. The story is a different take on the story of Tamar and Judah that it was God's will from the start for Judah to marry Tamar and that Judah had followed human reasoning when he gave her to Er instead. When both Er and Onan died, it was then up to Tamar and Shelah to orchestrate the marriage of Tamar to Judah instead of Tamar just taking the fulfillment of the levirate marriage into her own hands to get an heir through Judah instead of Shelah. The book also says that Judah was tricked into marriage instead of what the Bible says where it says that Judah saw a Canaanite woman and took her as his wife. The author's note at the end of the book was interesting learning why she portrayed Er's sin the way she did based on Talmud tradition. The book was well written, but I was not comfortable to all the references to "he came in to her" , "he felt his seed release inside of her", "he came so close to coming in to her that she felt him touch her leg", "I shall plant my seed in her as the Canaanites do where it can never bear seed"...."in the manner of men (with men)". They weren't graphically described, but it was more than I like to have in the books I read. I was given a free copy of this book in exchange for my honest review. All thoughts and opinions are my own and no other compensation was received. Lydia Esh feels like she needs to look after her younger sister Emma and make sure she doesn't do something she shouldn't. This causes Lydia to follow her sister to parties and puts her reputation and job as a schoolteacher on the line. She finds a co-conspirator to separate Emma from her boyfriend in Caleb Miller, who is just as desirous of getting Emma away from his brother as Lydia is. Lydia is not prepared for the strange sensations she feels whenever Caleb is around, but she can't fall in love with an Englischer when she plans on staying true to her faith and joining the church. 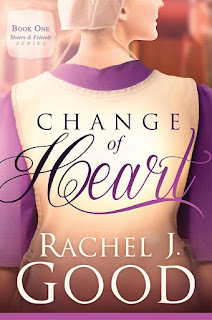 "Change of Heart" is the first book in the "Sisters and Friends" series by Rachel J. Good. This book was a roller coaster of emotions. I stayed up too late reading on more than one occasion and other times, I'd planned on reading for a short time and the book just drew me in and captured my attention. I truly did not know what was going to happen until the very end of the book and it kept me on my seat waiting to find out. The characters' growth through the book is a reminder that everyone has space for improvement. I am eagerly waiting for the next book in the series. 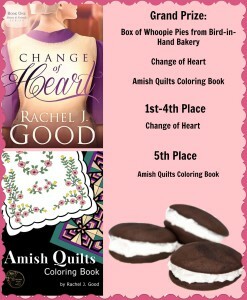 I would recommend this book to those who like Amish romances. I received a free copy of this book to give my honest opinion. All thoughts and opinions are my own and no other compensation was received. Mike Emerson wants to settle down, but his professional life is a little hectic and he hasn't found the right woman. He thought he may have with Emma Daniels, but when she got back together with her ex-husband, he ended up standing up for Ryan Daniels in the wedding. He wasn't expecting to walk in with his old girlfriend from high school, Jillian Matthews. Jillian Matthews is a widow with a 9 yr old daughter. She has been putting her daughter and her needs before her own for so long she isn't sure she knows what she wants any more. 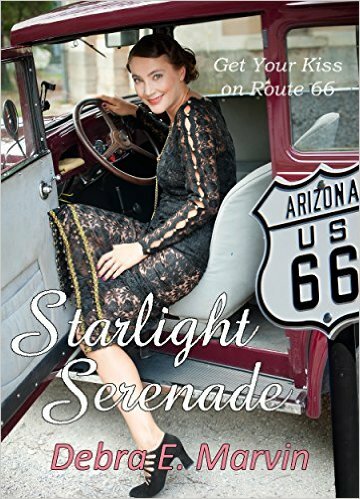 When she encounters Mike Emerson, she finds herself being drawn to him like when she was in high school. How is she to know what she is feeling is God given or just loneliness? 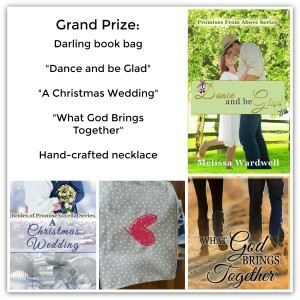 "Dance and Be Glad" follows "What God Brings Together" and "A Christmas Wedding". It actually overlaps the very end of "A Christmas Wedding" and the first part is before the epilogue of "What God Brings Together" (Which takes place completely after the events of "A Christmas Wedding"). The books are so tied together that I would recommend reading them in order (possibly waiting on the epilogue of "What God Brings Together" until after reading "A Christmas Wedding"). I liked the characters and getting to follow the people we had meet previously. I saw several stories that I'm sure are waiting to be written. I enjoyed seeing Mike progress from not having a clue about how to be a parent, to being secure in his new role as Emily's guardian/parent. The relationships felt real and natural. Being from Michigan, I loved all the references to things here and it felt so natural for the characters to order a "pitcher of pop" at the pizzeria or to wear a blue and yellow U of M shirt. And the snowstorms....One of my favorite lines in the book was "It seemed that Michigan weather couldn't make up its mind on what to do". I have personally said something just like that! I stayed up too late to read, I laughed, I cried. I look forward to the other books planned for this series. I am an independently published author of Christian romance. I wear many hats from one day to the next. I am a devoted wife, basketball and dance mother, teacher, taxi service, friend, caregiver, daughter, sister, and now, published author. Seeing all that is enough to make my head spin. But more importantly, I am the Daughter of the Most High King. I was raised in and still reside in a little farm town in Mid- Michigan called Corunna. It’s quiet and simple, just the way I like it. If I can’t live out in the country among the corn fields and trees then living in this small town works for me. My husband and I have been together since high school and have 3 children, all of whom we homeschool. It has been quite the journey, but I couldn’t ask for a better life. I decided to give writing a try because I needed something to occupy my down time, but after reading my first draft of my first book, What God Brings Together, I then understood that God had a much bigger plan. God does not give His children a desire just so that it can go to waste. I never anticipated the journey God would put me on through writing, but I am excited to see what He has in mind for the future. I have always felt a call to reach out to women and mothers, to encourage them in their lives. So naturally, all my stories revolve around women who are mothers: single mothers, widowed mothers, young mothers, married mothers, and even women who have a mother’s heart but no children of her own. My greatest hope is that each story touches your heart, gives you hope, or just gives you a moment away from the chaos of life. Lord, knows we have earned it. When I wrote the first book in this series, “What God Brings Together”, it wasn’t supposed to become a series. It has seemed to have a mind of its own and is spiraling into other books. You met Dr. Michael Emerson in the first book as the third wheel to Emma and Ryan’s crazy triangle. As soon as I finished it and read through it one last time, Mike’s character begged to have his own story. I felt bad giving such a nice guy a sad ending. So an idea formed for a story focused on him but it took me a while to decide on who his other half would be. I was sitting in front of the dance studio two of my kids attend, and it hit me. A Dance teacher and studio owner. From there the story went out of control- in a good way. The dance studio is the actual studio my kids dance at, and much of the descriptions of the location are the same as the space. The town is even the real town this studio is in. It is such a quiet place and I love it. I live in the area this series takes place. The county has a funny name as it is a Native American name – Shiawassee. It is nothing but small towns and farm land. New Lothrop, the main location for this story, has a population of approx. 600. I spend many hours there because of dance and I have grown to love the quiet little farm town. I like to bring light to actual business in some of my work, so when I chose to write in Infinity Dance Company I had to include the location. There is also a neat little coffee shop that I talk about in this book that is also an actual coffee shop. I am all about promoting local business, so if I can plug a cool business in my books, I will. You will see a bit more of another character from the first book, Tiffany, and you’ll get some insight into her story as well but you won’t get the full picture until the release of “I Know the Plans” which is set to come out no later than next spring – hopefully. I also introduce a new character in “Dance and Be Glad” whose story is heartbreaking but you won’t know much more until book four “Redeemed Through Grace” comes out in 2018. 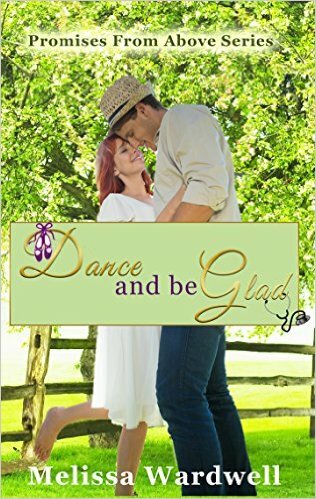 “Dance and Be Glad” is about finding joy in the middle of uncertainty and the scary moments in life. We can let the sudden changes bring us down or we can look at them as an opportunity to learn something new. I have witnessed a lot of tragedy and sudden losses in my personal life to learn that God still has me in His hands even when I feel like my world is crumbling. My prayer is that each reader can have a similar revelation. I received a free copy of this book in order to review it and give my honest opinion for the Celebrate Lit book tour. No other compensation was received and all thoughts and opinions are my own. Clara Longworth and her brother Henry are on their way to Hollywood for a fresh start when their bus breaks down. They end up in Flagstaff, Arizona and Clara fills in for the entertainment for a nightclub. When she ends up being involved in a plot to blackmail a government official, she isn't so sure of her fresh start. Julian Dyson is hoping to win the approval of his bosses back home in London by entertaining the government men for a few days. When one of them is blackmailed under his watch, he is sure that his opportunity for advancement is out. Julian teams up with Clara to make sure he doesn't loose his job. He already knows that showgirls are trouble, but why does he want nothing more than to spend time in Clara's company? This is the first book I've read by Debra E. Marvin and I loved her writing. I discovered that I own another book she's written, so it is getting bumped up the To Be Read pile! Julian and Clara were realistic and developed. I enjoyed reading about Henry, also. Clara has a nice little spiritual journey story arc. Besides the romance aspect of the story, there is also the mystery and suspense of who is doing the blackmailing. It was fun to not have figured it out before it was revealed in the book. All the historical details and culture of the 1930's setting were amazing and fun to read. I also really liked the astronomy terms at the beginning of each chapter and that they tied into the story. I received a free copy of this book to review. A positive review was not required and all thoughts and opinions are my own. No other compensation was received. Addison Lewis needs a break from her real life being in the spotlight, so she heads to Montana to escape reality. 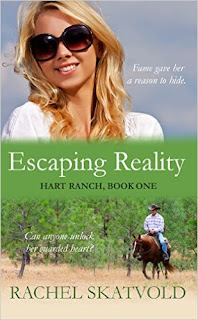 When she ends up stranded at Hart Ranch, she discovers things about herself she didn't know and starts to feel things toward the handsome cowboy who rescued her that she doesn't expect. Logan Hart knows that Addie is trouble from the moment he rescued her in the rain storm. He is caught off guard when he starts feeling things he hasn't in a long time. Can God heal their broken hearts and lead them together? I liked Logan and Addie and I really liked Gramps. He was so open and got people to think things through. There are several sub-plots going on throughout the book with Ava and Dylan, with Belle, with Mrs. Hart, and with the future of the ranch. It didn't seem crowded, but filled out the details well. The characters "gulp" a lot. I found it sort of odd to have that word used so much. I did like Addie's spiritual story arc. I found the book to be easy to read and I found myself wanting to visit Hart Ranch. I am looking forward to reading the next book in the series. 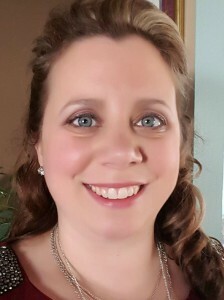 Rachel Skatvold is an inspirational author and stay-at-home mom from the Midwest. 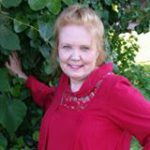 She enjoys writing inspirational romance, devotions, encouraging blogs. 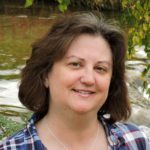 Rachel has just finished her first series, the Riley Family Legacy Novellas and is now working on her first full length novel, Enduring the Flames. Other than writing, some of her hobbies include singing, reading and camping in the great outdoors with her husband and two young sons. Have you ever needed to escape? Every year my husband and I plan our summer vacation several months in advance. We hardly ever plan anything lavish or expensive. Most of the time we just hook up our camper, load our kids and family dog in the truck and head to a state park for our “escape.” Some of our most treasured family times have been enjoyed without television, electronics or other luxuries. It’s refreshing to leave the noise of the city for a while and enjoy a nice walk in the woods or a quiet night roasting marshmallows over a campfire. It gives us time to rest and appreciate the simple blessings that God has given us. If someone ever needed to escape, it’s Addison Lewis. From the outside it seemed like she had it all; fame, fortune and a handsome and successful fiancé. However, when her dreams of a happy future come crashing down Addison flees her home in LA and ends up stranded at a dude ranch in the Montana wilderness. There she meets a handsome young rancher named Logan and his family. Will the Hart family’s faith and simple ways help Addison discover God’s true purpose for her life? Escaping Reality is inspired by Mathew 11:28 which says, “…Come to me, all of you who are weary and carry heavy burdens, and I will give you rest.” This theme verse is prevalent throughout the story because Addison is searching for a refuge that will provide peace and rest from her stressful lifestyle. However, in the end she discovers that the peace and rest she’s looking for is not a physical destination but a condition of the heart. Addison and Logan’s story was one of my favorites to write because of Addie’s spunky personality (not to mention her tendency to fall into mud puddles) and Logan’s courage during hard times. This story might make you laugh out loud and shed a few tears but most of all I hope it inspires you to recognize and appreciate God’s simple blessings. Happy reading, friends and I hope you enjoy reading Escaping Reality. 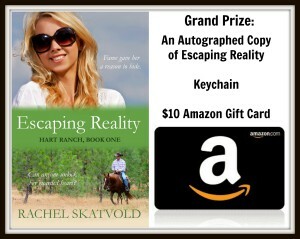 To celebrate her tour, Rachel is giving away an autographed copy of her book along with a $10 Amazon gift card. Click here to enter: https://promosimple.com/ps/9e0a. I received a free copy of this book in order for me to give an honest review and participate in the book tour with Celebrate Lit. All thoughts and opinions are my own and no other compensation was received.